The Watchman Signaling System is a signal system designed to indicate inportant sounds for individuals who are deaf or hard of hearing. 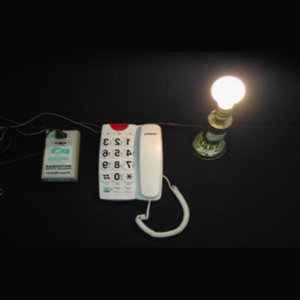 The Watchman Phone Master directly connects to the phone line and a lamp and flashes the lamp on and off when the telephone rings. The Doorbell Master monitors the doorbell and can be connected with or without an existing doorbell. The Sound Master alerts the user to a baby’s cry, an alarm clock or any other important sound. A lamp on-off switch allows the lamp to be plugged directly into the Watchman. The Doorbell and Sound Masters offer adjustable signal lamp flash rates, adjustable sound-signal control, and page switches for paging people throughout the home. The Watchman Receiver flashes signal lamps in other rooms whenever any Master unit responds.